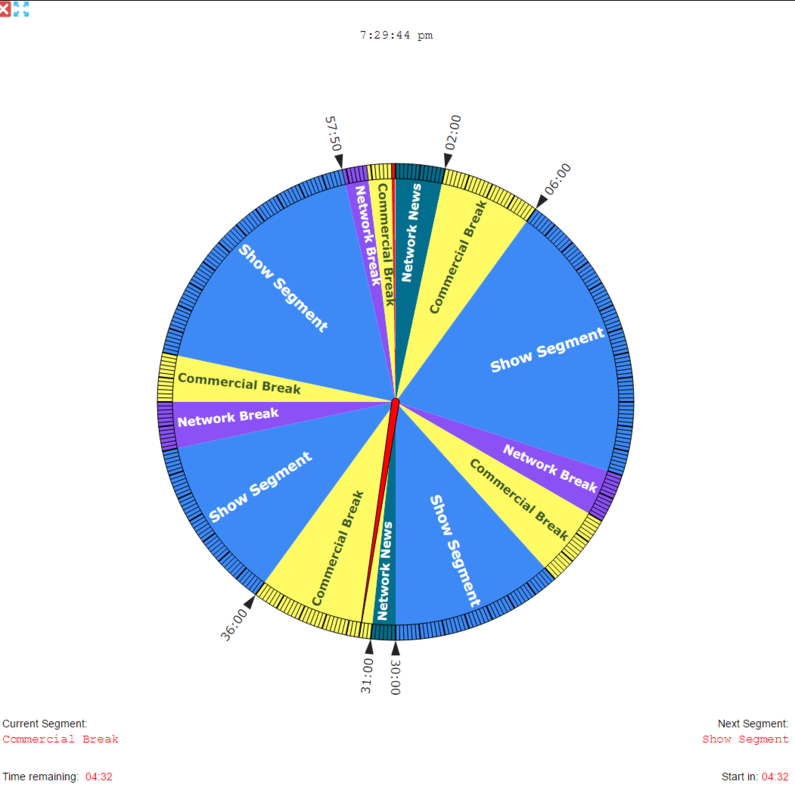 Start designing your clock by creating clock segments. Open Segments from the menu, enter a name, choose color and font style, and click SAVE. You will see the new segment in the Saved Segments box. 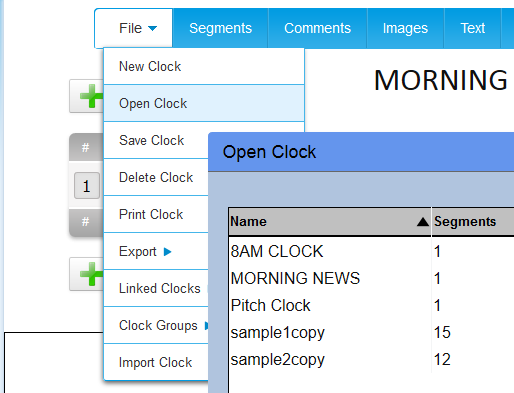 Close the Segments window in order to assign starting and ending times for each of your segments on the Control Panel. 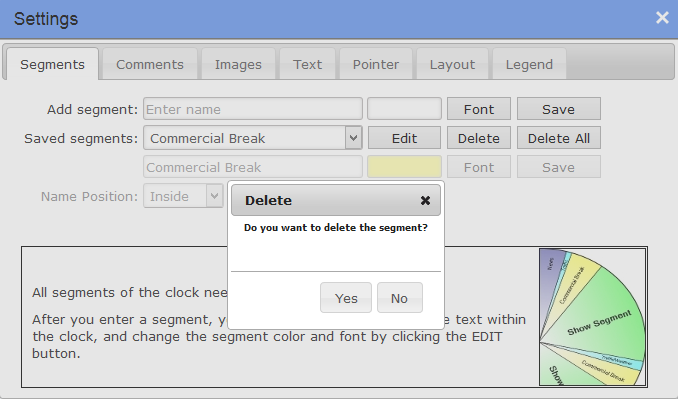 If you wish you edit a segment, select the segment you would like to edit from the Saved Segments box, and click EDIT. To delete a segment, select the segment you would like to delete from the drop-down box of Saved Segments, and then click DELETE. To delete all of the Saved Segments, click DELETE ALL. You can add a segment name and select one of the two available positions: inside or outside the clock. 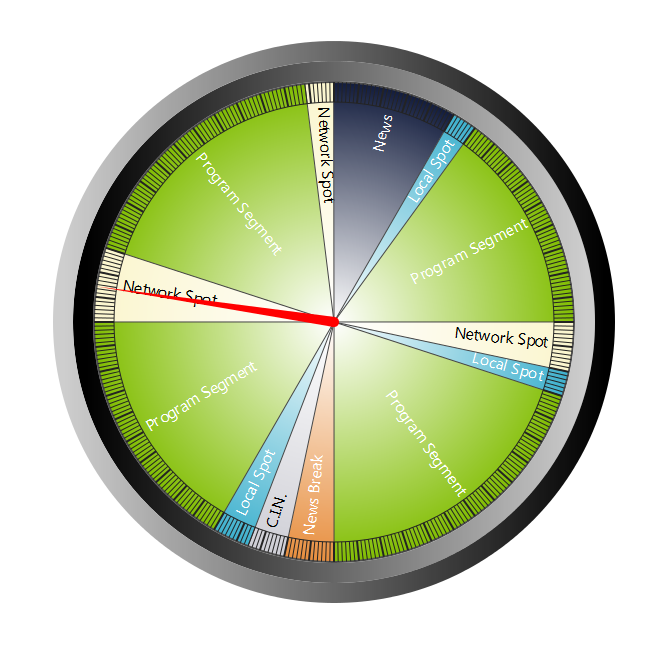 The Active Clock takes the static hot clock that was created with uClock.it or The Broadcast Clock Creator and transforms it into a working clock in your browser. On the main Control Panel of application, click on Active Clock and then Settings. Here you can configure how you would like for your Active Clock to look. You can save your Active Clock Settings for this clock so that it will always be associated with this clock on uClock.it and not interfere with other clocks that you have saved. There are two styles of The Active Clock in uClock.it. The first style is a detailed version that includes segment information, and the second style is called The Frameless Active Clock. You can adjust the color of the Frameless Clock border and the size of the Frameless clock that best fits your monitor and needs. When you have finished configuring your Frameless Clock Active Clock, click Close and the Frameless Clock will appear. The Minute Hand will move in real time according to the time of day. When you first enter the uClock.it application, you will see the main Control Panel. Once you have selected the Layout and entered clock data, you can preview your work by scrolling down to the preview area. To add a comment, enter the time that you would like to have the comment displayed, followed by the comment text and then click ADD COMMENT. You will then see the comment appear in the Saved Comments section. To delete a comment, select the comment you would like to delete from the drop-down box of Saved Comments, and then click DELETE. To delete all of the Saved Comments, click ALL. When the EDIT button is pressed for a Saved Comment, a variety of functions are displayed. Here you can select to have the Comment Time displayed (this is the time outside of the clock and next to the comment); you can also adjust the time of the comment or the comment text, font, size and color. The LINE LENGTH is the line that extends outside of the clock and where the comment is displayed. You have the option to extend this line (if there is a lot of text), or shorten the line. The default line length is 30; a higher number means a longer length. You also have the option to change the color of the line. When all of the edits to the comment are finished, click SAVE EDITS and your comment adjustments will be saved. Add Segment Button and Window - Allows you to add a new segment to the clock. Remove Segment - This option is activated after you have added your first segment to the clock. This will remove the last segment you have entered. Start Time - This is the start time of the current segment. Each time you add a segment, the end time of the previous segment becomes the start time of the new segment. End Time - This is the end time of the segment. You can select the length in minutes and seconds. Segment - This is a drop-down menu of segments that you have already entered. TIP: You have the option to not display the name of the segment within the clock. To activate this feature, click on Segments at the top, select the segment that you want from the drop-down menu and click EDIT. Here you will see the option to display the segment name. This feature is particularly handy when there's a short segment, like a Legal ID. Display Time - Gives you the option to display the time outside of the clock. Display Pointer - Gives you the option to display the pointer outside of the clock. Display Name - Gives you the option to hide the segment's name. Insert Segment - This option is activated after you have added your first segment. This will give you the option of inserting a new segment between two segments that you have already added. The start time of this new inserted segment will automatically be the end time of the previous segment. You can then enter the end time of this new inserted segment. NOTE: If the end time of this new inserted segment goes PAST the start time of the next segment, you will need to adjust the start time of the next segment. Delete Segment - This option is activated after you have added your first segment. 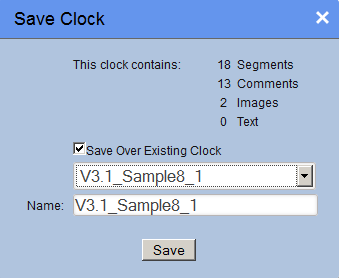 This gives you the option of removing a segment in the middle of the clock without having to rework the entire clock. The times are adjusted automatically. Here you will find all of the clocks that you have created and saved. To delete a saved clock, click on the checkbox to the right of the name of the clock you would like to delete, and then click the DELETE button at the bottom of the window. Once you have deleted a clock, it will permanently be deleted from the database. You can import clocks that are created using The Broadcast Clock Creator. Just go to File >> Import Clock and locate the clocks in the file system. Upload process start immediately after you choose a file. 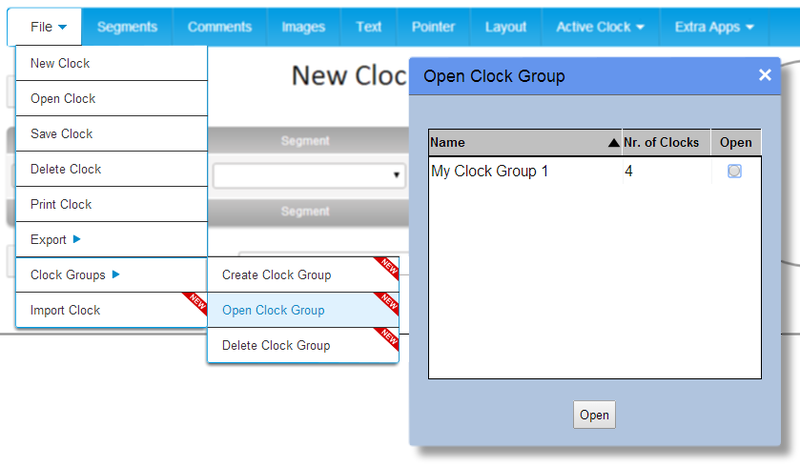 Now you can find and open your newly uploaded clock by clicking Open Clock. You can export the entire clock, or select items and features of the clock to export. You can then use these images for graphic presentations, Word documents, insert into HTML emails, blogs, sales tools, the list is endless. You also have the option to adjust the quality of the image (DPI). The smaller the DPI, the smaller the file and the larger the DPI, the larger the file. Higher DPI numbers are great for print media, but can slow down email transfers or images being displayed on a website. The default DPI is set at 300.
uClock.it also has an option to export your clock using Grayscale (black and white). 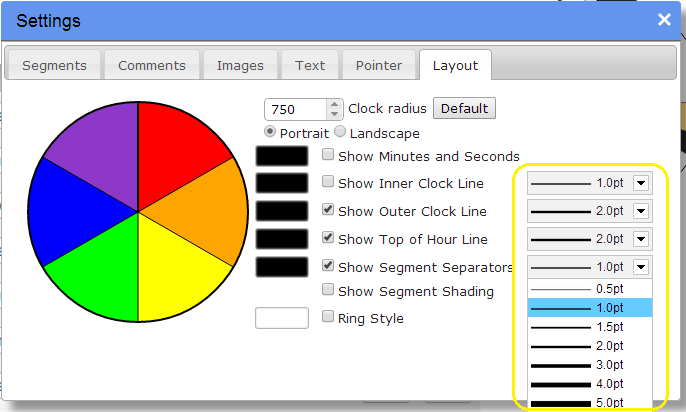 Embedded Fonts option allows you to export a clock with the exact font selected during design. It prevents font incompatibility issues in your computer and PDF reader will display your preferred font on the clock. You can also print these high-quality PDF clocks. You can enter any email address to send your clock to. Generate Hyperlink option below the SAVE button serves for generation of a direct link to your clock in PDF or image format. 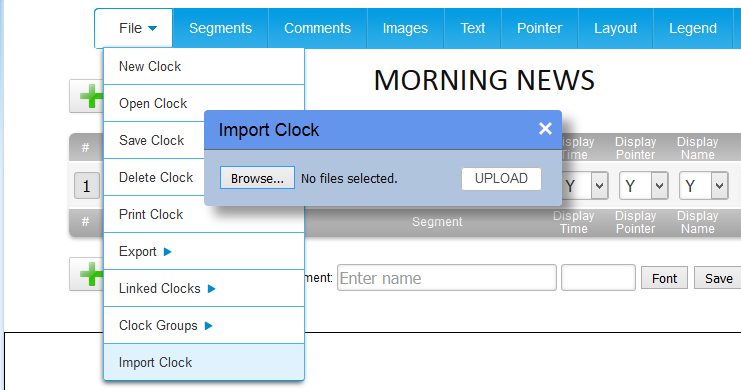 You can use this link to showcase your clock on your radio station website or blog articles. 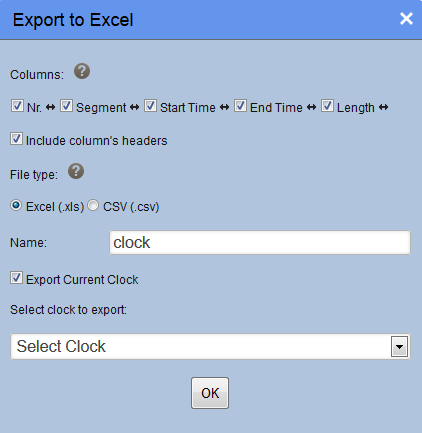 In response to a feature request from one of our valued customers, we added Export to Excel item under File menu that allows you to extract your clock data to a spreadsheet (XLS and CSV). It includes columns such as Number of Segments, Start Time, End Time and Segment Length. There are many ways to add an image to a clock. 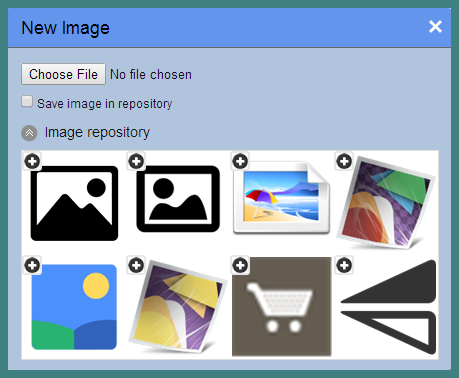 First, select where you would like an image to be by clicking on a box or rectangle. Then select an image from your computer to put in the clock. uClock.it can accept JPEG, GIF, PNG and BMP files. Once you have selected the image from your hard drive, you will see the image appear inside the box. The option to remove the image can be found by right-clicking on this box. You will see your image on the Clock Preview and can make size adjustments if needed. The number in the bottom right corner of the image box is the size of the image. If you would like to adjust the proportions of the image, right-click on the box that contains the image you would like to adjust. You will see an option for CHANGE SIZE. The smaller the number, the smaller the image area will be on the clock, the larger the number, the larger the image area will be on the clock. Whether you use the same or different images for your clocks, we thought saving and displaying them in one place would be a nice option to have. Upload any number of clocks to the app and you can access them anytime by opening Image Repository section of the Upload Image dialog. 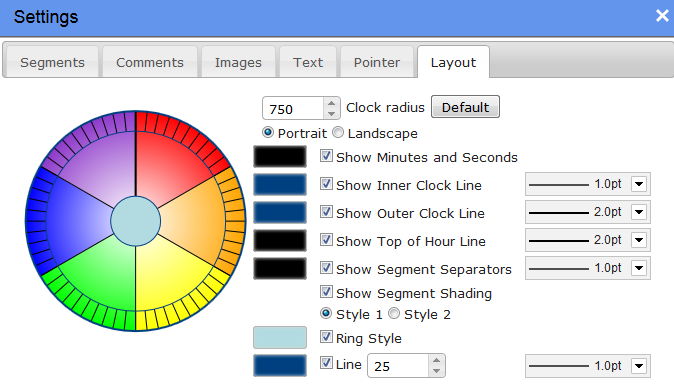 The Layout tab has a variety of different styles for your hot clock. Show Minutes and Seconds - Selecting this option will display a time grid around the clock broken into minutes and segments. Show Inner Clock Line - Selecting this option adds a line that would go on the inside of the clock next to the time grid. Show Outer Clock Line - This is the line that defines the outside of the clock. This is selected by default. Show Top of Hour Line - This is a bold line that defines the top of the hour. This is selected by default. Show Segment Separators - These are lines that separate segments. This is selected by default. Show Segment Shading - When selected, there are two different styles of shading for you to choose. Ring Style - This effect allows you to create a space in the middle of the clock. The size option determines how much space is allowed in the clock. The default is 30. There is also the option to define the space with a line. Clock Radius – You can easily set any size you want the clock to appear on your screen. You can customize the colors for each of these individual features as well by clicking on the color button to the left of the feature. 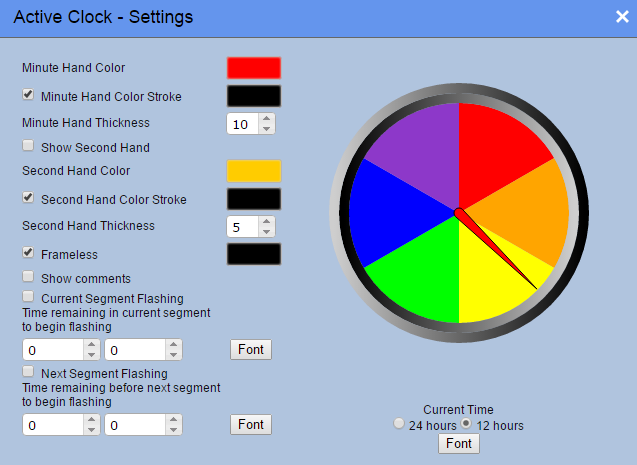 Once you have selected a color, the button will change to the color specified and you will see the change on the clock template to the left. There are several places in your clock template where you can use lines with different colors. It includes Inner Clock Line, Outer Clock Line, Top of Hour Line and Segment Separators. To give you even more possibilities and accommodate more designs, we introduced line weights which allow you to control the line size, from 1.0 to 5.0 pt. Here you will find all of the clocks that you have created and saved. 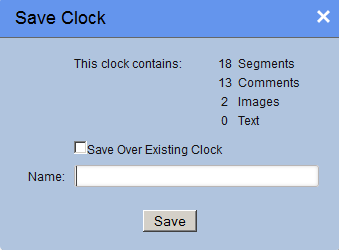 This window also gives you specifics about the clock like how many segments are contained within the clock, etc. To load a saved clock, select the checkbox to the right of the clock you would like to load and then click OPEN. If you wish to start over and create a new clock, before creating a new clock from the beginning you have the option to delete all of the clock contents (Segments, Comments, Images and Text), or to selectively delete contents. By default, uClock.it selects all of the contents to delete. Clock Groups feature allows you to organize your clocks. The pointer displays the start of a segment and the start time. In the Pointer tab, you can change the color of the pointer as well as the font, size and color of the start time of the segments. Pointer time can be displayed horizontally, which is a bit easier to read. Ability to enter additional text (frequency or any other information) is another feature that radio programmers would appreciate. 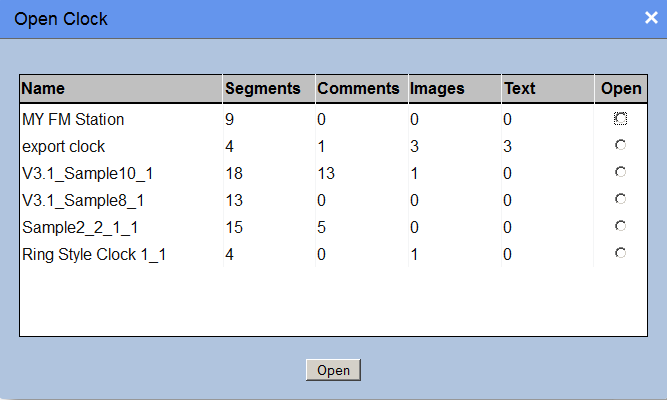 NOTE: On the Control Panel when you are entering your segments there is an option to Display Time and Display Pointer. If you do not wish to have a pointer or time displayed for a particular segment, you can choose not to display it on the Control Panel. 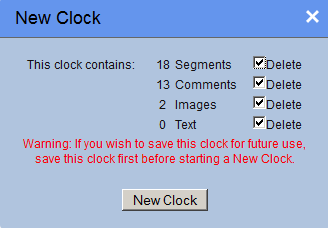 These options are only available after the first segment has been entered when creating a clock. This window gives specific information about the clock contents and a window for you to type in the name of this clock you are about to save. If you would like to save this clock over an existing clock, click the checkbox and you will see a drop-down selection of clocks that you have already saved. Select the clock that you would like to overwrite, and then click SAVE. Like adding images, there are many ways to add text to a clock. First, click Text at the top of the main Control Panel. Next, select where you would like to add text by clicking on a box or rectangle. A window will open for you to enter your text. In this window, you can adjust the style, size, color and formatting options for your text. When the text has been entered, click on the SAVE icon (the disk). The option to remove the text can be found by right-clicking on the box where you originally entered the text. If you would like to adjust the proportions of the text area, right-click on the box that contains the text you would like to adjust. You will see an option for CHANGE SIZE. The smaller the number, the smaller the text area will be on the clock, the larger the number, the larger the text area will be on the clock.